Spring is on its way, and so is turkey hunting! A lot of hunters around the world are gearing themselves up for this adventurous sport of the season. Along with a perfect camo suit, a hunter face mask is a must while hunting these skittish creatures. Turkeys are incredibly timid by nature. Hunting down these birds can be a real challenge, and a perfect camouflage can successfully walk you through this. 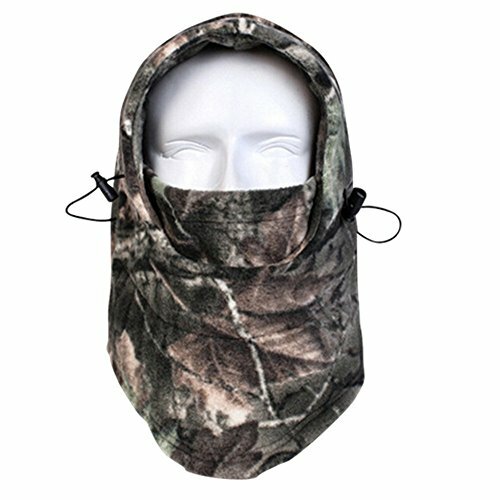 So, for all hunters around the world who are looking for the best turkey hunting face masks, this article can be your real friend. Balaclava: This mask covers the head, face, and neck of the hunter simultaneously. These are widely used in the colder regions to shield the hunter from the extremely chilled conditions. However, balaclava lacks any adjustment near the eye holes. Mouth mask: This mask is usually worn by the hunters to cover the area below their eyes, i.e. they cover the mouth and sometimes the neck region of the hunter. Typically, a lot of people match these masks with a hat of their choice to create their camouflage pattern. These masks do not have a firm size; thereby it can be used by an extensive section of hunters. The design is usually breathable and comfortable for the hunters. Open top: These masks are more or less like a balaclava, but without a top, i.e. it covers the facial and neck regions of the hunter. These masks render proper warmth and insulation to the user. Hunters may opt for a hat or a rainy-helmet as per their choice. Glass masks: These masks are used with compatible sunglasses. They ideally cover the head and face of the hunters. They can be used to hunt down the rainy day gobblers. However, ensure proper ventilation and durability of this mask before you purchase them. First things first; so let's start with one of the crucial factors that should influence your choice to buy your perfect hunting mask. Hunting down these gobblers can span over an extended period of 8 to 10 hours. A good mask can aid the hunter to survive these long hours of hunting quite comfortably. It should regulate the temperature and provide perfect ventilation for heat and sweat. Apart from this, the mask should inculcate a proper opening for the eyes and mouth of the hunter, without compromising on his concealment. Such vents ensure a breathable and relaxed experience for the hunter. Some of these masks also feature detachable straps or mesh covering across the eyes and mouth of the hunter. These masks also check sunburns and protect the face from harmful UV rays, while you can confidently sneak out in the woods to hunt those toms down. Longevity of a hunting face mask is an important aspect that needs your consideration. Always opt for masks that are durable and breathable at the same time. A synthetic mask is an ideal choice for a lot of hunters as it tends to be sturdy and minimally light on their pockets. Before you purchase your mask, make sure to check the stretch ability of the material. In case you notice any loose stitching or imperfect finishing, abort the mask. Such masks will fail to endure the tough and rigorous effects of turkey hunting. Fleece or synthetic masks with a blend of spandex can ensure its stretch ability. This feature is essential, as it permits the hunter to possess free head movements. It is recommended to focus on the quality of the mask even if it is a little expensive so that it can last longer. Always opt for hunting face mask that is easy to use. Such masks reduce the reaction time of the hunter once they have an unfortunate encounter with their prey. A lot of varieties are available for the instant use of the hunters, such as a mask that looks like a simple hat and can easily be moulded into a mask when required. Hunt mask must feature a proper opening for sunglasses. Hunters less prefer masks with small eye holes as they tend to restrict the use of glasses and can even block the hunter's vision. There are varieties of masks such as tucked-up mesh covering hats or dual-purpose headpieces that can be used as a hat or as a mask. Apart from these significant factors, several other features like the length of the mask, leafy aesthetics or camouflage colour pattern govern the choice of a perfect hunt mask. Mimicry: This pattern usually refers to a resemblance of the mask with its surroundings. The mask should match to the suit of the hunter too. Ideally, the choice of the pattern depends on its season of use. For instance, a green pattern is ideally used on the onset of the season, and a brown dried leave colour marks the offset. Overall, the pattern should match with the surrounding and the suit of the hunter to provide a perfect camouflage. 3D: Hunting face masks with the 3D leafy pattern are extremely popular. This is credited to the smooth blending of these patterns with the surrounding. Moreover, even if the birds encounter any rustle, they might confuse it with a tree or bush movement. These masks render a natural and leafy texture to the hunter's look. Such masks usually rank a position in the turkey hunting checklist. Breakup: Here in the hunter endeavors to break up the outline. Often, such patterns allow the hunter to blend with logs or trees while they pace forward from one location to the other. Turkey hunting masks have a wide range of aspects and varieties to it. The choice of these mask depends on the hunter, and various factors like the season of the hunt, the hunting ground, weather or even the hunting suit. In regards to all these, a hunter must choose his/her hunting face mask. Ergodyne mask has a real tree camouflage feature that allows the hunter to blend perfectly with the surrounding. The realistic pattern along with the intricate colors of the fleece mask conceals the hunter from any encounter with its prey. The mesh inset over the mouth ensures breathability as it facilitates breathing in and out of fresh air and also prevents fogging of glasses or sunglasses. It is also paneled with wind-resistant fabric that protects the hunter during unfavorable conditions. The product displays its versatility via a hinge design that allows the hood to shape up in a ski mask or a neck gaiter. Moreover, the mask renders optimal coverage and improved flexibility that shields the hunter from cold and can fit onto their head with no effort. Furthermore, the mask is lightweight and can easily fit under a helmet without increasing any bulkiness. Thick and durable design with a realistic camouflage pattern. The eye vents are large enough to allow usage of goggles. Full-length coverage ensures protection from wind and cold. A versatile design that will enable you to shape the mask as per your use. The mask is stretchable, and it can easily fit on any head structure. Improper fit around the ventilated area. Fails to deliver the advertised effects in extreme temperatures. 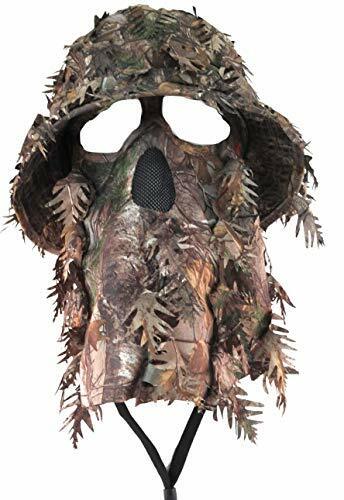 DecoyPro Camouflage Face is one of the best hunting face masks that are available in the market. At a reasonable price, the mask delivers the qualities and features of an expensive high-class version of the product. The excellent camo effects of the mask allow the hunter to escape an unwanted encounter with the birds. Apart from its excellent concealing power, it is exceptionally comfortable and enables the hunter to be relaxed during the entire episode of hunting. It is a lightweight mask that effectively absorbs the moisture and can quickly dry up. The mask is highly flexible and can easily fit from an adult to young head shape. DecoyPro has specially incorporated an extended neckline to the mask that instills an extended concealing to the product. Apart from all these, the mask is adaptable for various sports like bow hunting, or duck and turkey shooting. Its quick-dry feature prevents any fogging or suffocation to the hunter. The material is light and perfectly ventilated thereby allowing the hunter to breathe comfortably. The extended neckline conceals the neck part, thereby shielding the hunter from harmful UV rays. A sturdy and comfortable product at a reasonable price. The fabric is thick but not soft. The vent near the eyes is uncomfortably firm to stretch. It is a multipurpose mask by Your Choice that allows the product to be used as a face mask, balaclava, beanie or a hood. This versatility is accompanied by a high-quality well-stitched design that ensures complete protection from dirt, wind, heat or chill. 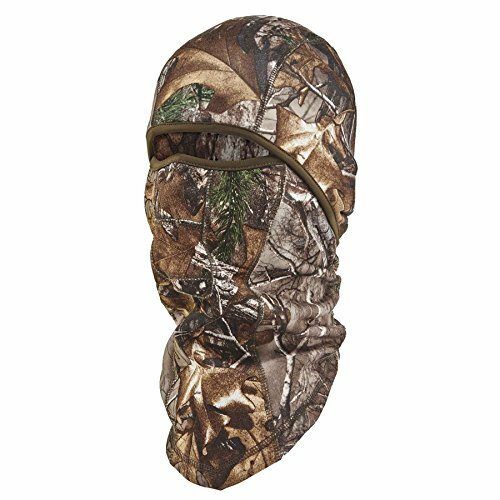 The fleece fabric of the mask regulates a perfect temperature thereby permitting the hunter to use it for fishing, hunting, trekking or camping. The mask is highly stretchable with a left and a right clip that is used to adjust top and mouth ventilation respectively. The material is flexible enough to fit in different head shapes. Apart from all these features, Your Choice also offers a 12-month full money back warranty on this product, so that you can enjoy a care-free experience. Overall, this product is too good for its price. A multipurpose mask that can be used for hunting, fishing, skiing and a lot of other sports. The material is soft, breathable and antistatic, thereby making it an ideal choice for hunters. The mask is adjustable, and the user can wear it comfortably with the use of clips and velcros. A generous 12-month money back warranty ensures a care-free purchase. It is foldable enough to fit in a pocket. You need to wash the mask before the first use to get rid of a weird smell. The fit can be an issue, so try it on your head before you purchase one. Your goggles might get fogged up while using this mask. This product is a top-rated dual purpose mask by QuickCamo. It has an excellent camo effect with a 3D leafy structure that empowers its user to blend smoothly with its surroundings. These masks usually give a natural look to the hunter thereby can be easily used to fool those gobblers away. The realistic colours and intricate patterns of this mask make it a popular choice amongst hunters. The product is a combination of a hunting hat and a face mask. The mask can be tucked up, and the product is used as a hat; on the other hand by merely shaking the hat off, the mask falls on to your face. This mechanism improves the agility and comfort of the hunter. The duo perfectly conceals your face without blocking your eyes or ears. This leafy hat is used for hunting a wide range of species like deer, coyote, bears, or turkeys. Moreover, it features an extended 360-degree shade to protect the hunter from harmful UV rays. The fabric is extremely comfortable and supports easy breathing. Overall, this product deserves to be in your turkey hunting checklist. The double feature of a hat and a mask makes it a fantastic choice for agile hunters. Highly ventilated and will not fog up your glasses. The product arrives in different head shapes and sizes; thus you can choose the one that perfectly fits you. The mask can be quickly deployed from the hat. The fabric is breathable and soft. The hat shade shields the hunter from harmful UV rays. Though the hat features in different shape and sizes, it lacks stretch ability. It is non-washable; therefore it stinks after long use. 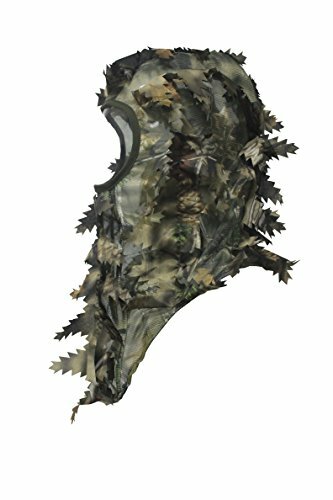 This mesh screen camouflage face mask is an excellent choice at a reasonable price. The mask is adorned with laser-cut leaves that assign a natural and sharp look to the hunter. Unlike most of the machine-cut leafy masks, this mask by Arcturus provides a perfect camouflage thereby saving the hunter from its skittish preys. Furthermore, the 3D pattern effects completely resemble the surrounding of the hunter. The mask features a drawstring at the rear end that makes it highly customizable. One of the striking features of this mask is its tuck-away front screen. The front screen provides complete facial coverage that increases the concealing power of the mask. On the other hand, when the screen is tucked away, it serves as a breathable and comfortable vent to the hunter. Overall, the mask is decently sized to fit into different head shapes and can be worn above thin caps to protect the hunter from extreme weather conditions. Detailed design and 3D effect enhance the concealing purpose of the mask. The tuck-away mask can be used for full coverage and can be easily tucked up to improve visibility. Great fabric that ensures proper insulation. It has a generous size and can fit comfortably on your head. The mask lights up under UV light, thereby restricting its use in some scenarios. The mesh covering over the eyes blocks proper view in low light. 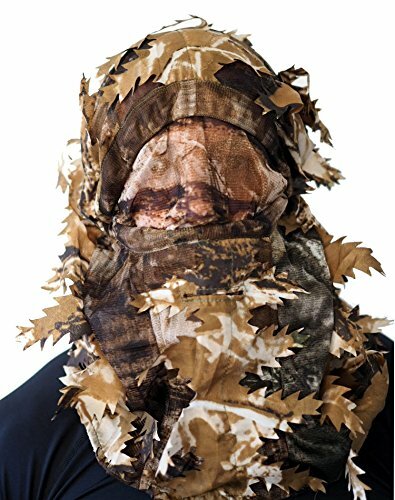 This hunting mask by QuickCamo features a realistic and natural design that allows the hunter to perfectly blend with the surrounding. It has a 3D leafy texture and can be shaped like a bucket hat or a hunting mask just by flapping the hat down. This feature allows a quick camo to the hunter, thereby living up to its brand name. The hat perfectly outlines the face of the hunters without compromising the visibility or hearing capabilities of the user. Along with that, the 360-degree shade protects the hunter from harmful radiation and sun exposure. Moreover, it is perfect to be used in warm weather as its quick-drying technique absorbs the moisture without fogging the mask. Apart from all this, the mask comes in different shapes and sizes, so you can choose the one that perfectly fits on your head. The realistic 3D leafy effect of this mask is quite impressive. Easy to see and breathe through it. The mask can be easily tucked up into a hat. The product is available in a variety of shapes and sizes, giving the hunters a number of options to choose from. It has a light-weight mesh that prevents accumulation of heat but at the same time, it serves as a shield against insects and bugs. Its 360-degree shade protects the hunter from harmful sunlight. Though the hat features in different shape and sizes, it lacks stretchability. The eye vent restricts the proper usage of glasses. It is a high-quality product by North Mountain Gear, available at a reasonable price. 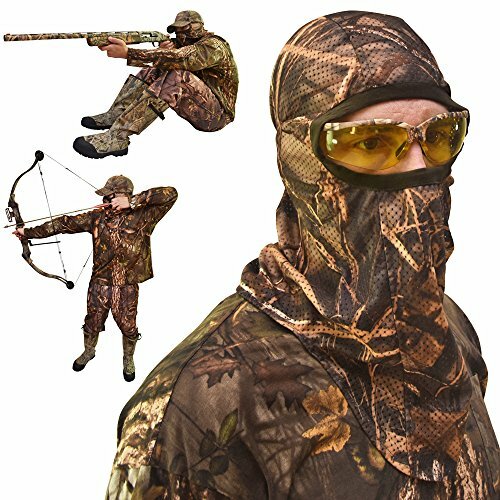 The product has a mesh netting base that makes it breathable and shields the hunter from bugs. The 3D leafy pattern over this mesh is extremely breathable and allows the hunter to have a comfortable experience with it. Along with its realistic design and pattern, the product is sturdy enough to survive a tough hunting environment. Unlike a lot of masks, the eye vent of this product is large enough to allow the usage of goggles and does not hinder with the hunter's visibility. The micro breathable mesh net facilitates the use of this mask in warm weather. The mask is available in a single size that is generous enough to fit most of the hunters. This product is a popular choice amongst alot of people because of its neat pattern and sturdy design. The fine mesh layer makes this mask breathable and soft. The eye vent allows the usage of glasses without fogging them. It has a sturdy design along with life-like leaf patterns. The mask provides full coverage that allows the hunter to effectively conceal from its prey. Only available in a single size. It is easy to see through, but the transparency should have a wood-like color or increased camo leaves, to provide proper concealment. 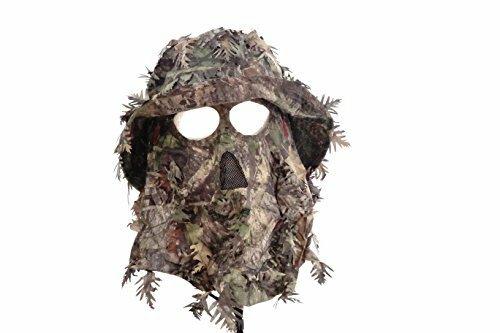 These are some of the best hunting face masks that are available in the market and can serve as an excellent camouflage gear for hunters. However, your choice is highly subjective and depends on the fit and comfort it provides you. One of the turkey hunting tips for beginners would be to pay close attention to the quality of these masks, as this can miraculously enhance their chances of shooting down a gobbler. Unlike face paint, a hunting face mask is not affected by rains or moisture. Turkey hunting can usually last for hours; therefore the sweat and moisture can smudge of the face paints easily. However, a face mask remains unaffected in such conditions. Instead, they absorb the unwanted moisture from the hunter's face and prevent any form of fogging, thereby making the experience highly relaxing and comfortable. Face masks not only serve as a camouflage gear but also protects the hunter from harmful radiations and bugs. The 360 shade provided by a wide variety of such hats, prevents the occurrence of sunburn or skin irritation. Apart from these, the mask can also serve as a mosquito net to keep these unwanted bugs away. Face masks are remarkably easy to use. Hunters can sweep it down their head, and it's ready, unlike face paints wherein the hunter has to invest a lot of time painting their faces with a versatile pattern. The advanced design of the face masks, such as 3D- leaf effects, makes them neat and natural. Such design enhances the hunting experience of the user as they provide excellent concealing powers to the shooter. The onset of the spring season is undoubtedly the best time to hunt turkeys. Thus, this article is focused to let the hunters choose the best turkey hunting face mask of the season. The choice of these masks depends on your comfort and the demands of the hunting ground. However, my personal favorite is the QuikCamo Realtree 3D Leafy Bucket Hat combination. Mainly this multipurpose product offers a fair camouflage, owing to its intricate pattern and 3D leaf effect at such a reasonable price. Its duo feature as a hat and a mask is extremely useful for any agile hunter. Till then, Happy Hunting!